August 4th 2014 will mark the 100th anniversary of Canada’s entry into the First World War. Organizations and communities around the world are marking this occasion by examining the effect the war had on their local area. We’ll be doing this in Deseronto, too. In the Archives we started by researching the 34 names of the First World War casualties named on the town’s war memorial. In the process we found out some interesting facts about the monument itself. The memorial, which stands on the South side of Main Street, opposite Rathbun Park, was unveiled in a ceremony on Labour Day (September 3rd) 1923. The event was attended by many of the townspeople, as the photograph below (one of several taken on the day) shows. A piece of land forty feet square was purchased by the Town of Deseronto from the Rathbun Company for the monument’s site, at a cost of $100. 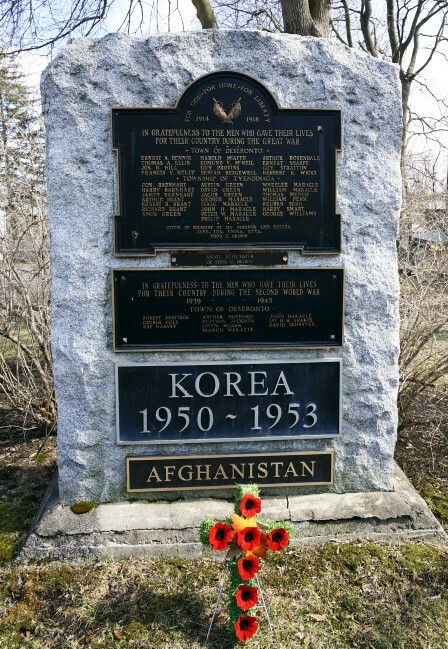 The memorial itself was donated to the town by a former Deseronto resident named Thomas Carson Brown. Thomas was born on 21 April 1870, the son of Thomas Brown and Emily Varty and one of 10 children. 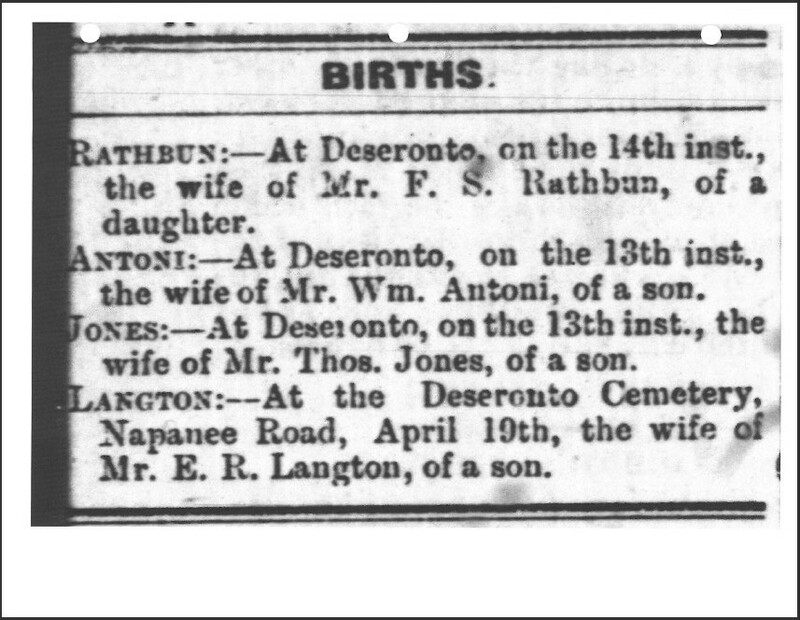 His mother died in childbirth in Lennox and Addington County (where the family had a farm) when Thomas was seven years old and by 1881 the family had moved to Mill Point (Deseronto). In the 1891 census, when he was 21, Thomas’s trade is given as bricklayer. His father died just six weeks after the census was taken. It was through the bricklaying trade that Thomas C. Brown would go on to earn his fortune in New York State, where his firm constructed a number of public buildings, including the Plattsburgh Normal School, pictured here, and a large section of the Clinton Correctional Facility at Dannemora. 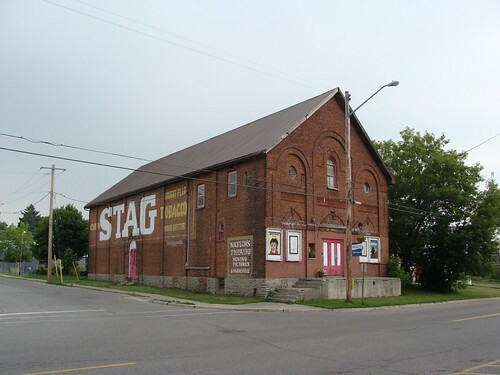 Deseronto’s newspaper, The Tribune, reported Brown’s marriage in August 1899 to Hattie B. Humphrey, noting that “the groom is well and favourably known in Deseronto, where he passed his boyhood days. He is now engaged in the contracting business in Little Falls. He is a brother of Mrs. Jas. Sexsmith.” Thomas’s sister, Jane Brown, married James Sexsmith in Deseronto in January 1884. She died of pneumonia in 1910. Brown went on to serve as a Senator in the New York Senate between 1925 and 1930, where he took a keen interest in prison reform issues. He clearly never forgot his home town of Deseronto, as the generous gift of a war memorial demonstrates. It is not just a war memorial, however, as Thomas C. Brown ensured that his parents and five of his sisters (Jane, Ida, Etta, Emma and Annie) were also commemorated on the structure, as you can see in this detail. 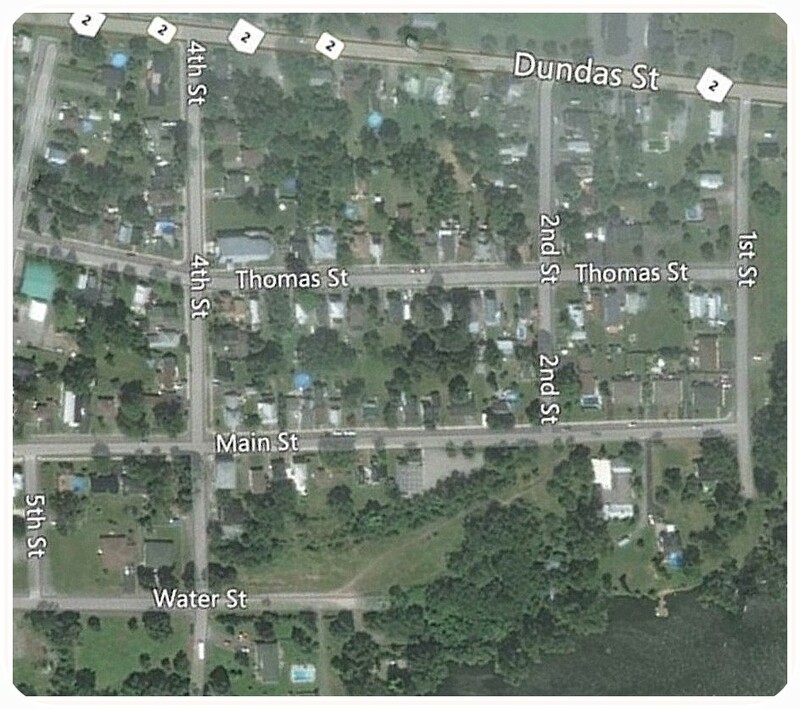 Thomas himself died on May 24th, 1952 at his home at 1174 Lowell Road, Schenectady, New York: you can read his obituary in the Schenectady Gazette (PDF made available through the Fulton History site). Over the next four years we will be marking the 100th anniversaries of local people’s involvement in the First World War here on the blog. There are a lot of stories to be told and we are always keen to hear new ones, so if you have any local World War One information which you would like to share with the world, please let us know! 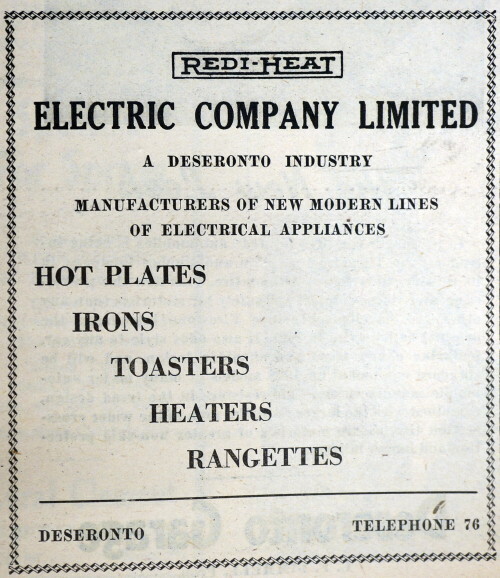 The Archives here in Deseronto has a rather patchy selection of local newspapers for the twentieth century. There’s a good run of The Quinte Scanner from 1968 to 1982 but apart from that we really only have lucky survivals of The Deseronto Post and a few editions of the Daily Intelligencer, Belleville’s newspaper. Finding out what newspaper we have for a particular year or decade involved consulting two different lists, the contents of which are not easy to absorb. We’ve now combined the information from those lists into a single online resource. It’s a Google Calendar into which each newspaper edition has been entered as an event. If you have a Google account, you can view the newspaper calendar, which we’ve made public. From the calendar page, click on the small symbol at the bottom right. 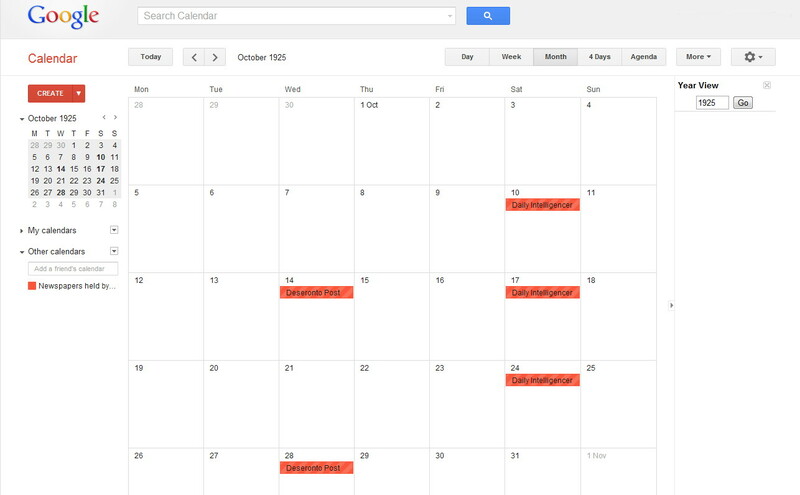 This will add the newspaper calendar to your Google calendar page. In order to see what we have for a particular year, you need to install the ‘Year View’ feature for your calendar (in Google Calendar, go to the ‘Settings’ page, then ‘Labs’ to do this). Once you have the Year View, you can use it to get to a particular year, then click on any month to see if we hold any local papers for that particular time period. 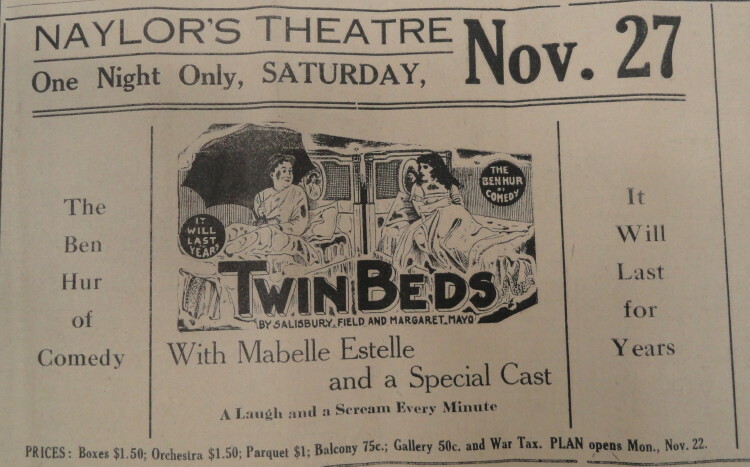 The picture below is of the month of October 1925, where we have two issues of the Deseronto Post and three of the Daily Intelligencer. Click on the image for a closer look. This is just an experiment, really, but it’s already proving useful in making it much quicker to answer questions about whether we have any newspapers for a particular date.